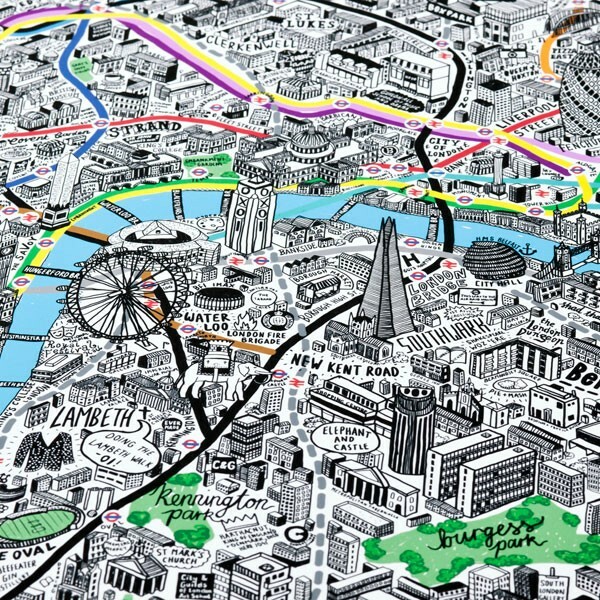 If you’re looking for a piece of art that perfectly captures the personality of the Big Smoke, then look no further than the wonderful Hand Drawn Map of London Framed Print by Jenni Sparks! By displaying the cultural essence of London alongside its key geographic areas, this refreshing sketch is a captivating twist on the traditional map design. Bursting with hundreds of illustrations of key landmarks, fun facts, and nods to British culture such as Del Boy’s infamous Reliant Regal sitting proudly in Peckham, it’s no surprise that this stunning homage to the English capital took nearly five months to create! It also goes far beyond the big tourist attractions, making it a great talking point in any home - your guests will be starting at it for hours trying to find their cherished local haunts! This brilliant cultural city map would make a wonderful gift for London lovers: it’s eye-catching, honest, and with the inclusion of the geographic tube map (covering most of zones 1 and 2), it is also a handy reference point! It is available in two sizes (A2 and A1), and with either a black or white wood frame. See on the right hand side for hand drawn maps of Paris and New York!